When you first enter the Terminal in The Endless Mission, immediately to your left is the Hall of Celebration. This is where we will feature the best games created by our community that are ready for you to play and remix in your own way. 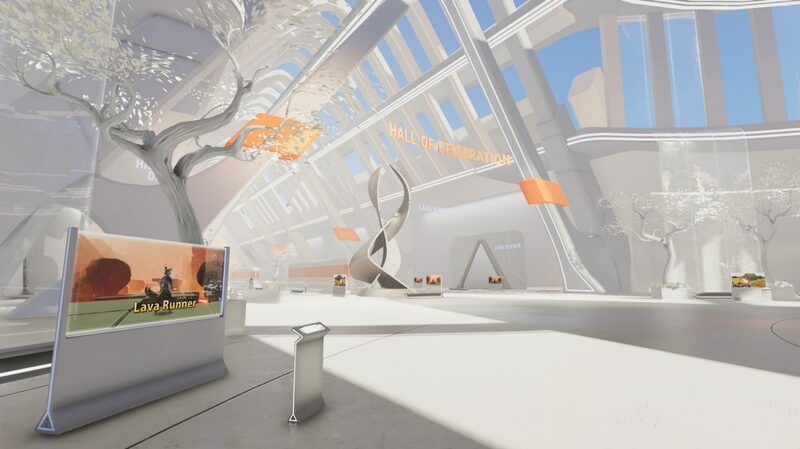 Since the game’s not available just yet, the Hall of Celebration was looking a bit empty so we took the opportunity to challenge our devs to create a few community games of their own to feature. What did they create? Read on and find out. As the name suggests, Lava Runner is our take on the popular endless runner genre. We constructed 15+ unique pieces using temple ruins assets from the platformer and set them to randomly spawn in three lanes and move toward the player. To create a difficulty ramp, we assigned weights to each piece which determined how often it would appear. We then curved up the weight on tough pieces (e.g. gates, lava) and curved down the easy pieces (e.g. squares) over time. Hilltop Defender is a king of the hill game where you are the kart racer avatar and are defending your base atop a hill from waves of RTS Undead knights. The original concept for this game was going to be a tube-shooter, like the classic arcade game Tempest — we ultimately decided to invert the formula and attack outward instead. You can see that we put the base up on stilts — this allows players to attack enemies “through” it rather than having to drive around it. We’re big fans of twin-stick shooter games, so when we realized that we already had an avatar that could shoot arrows in any direction, we knew what had to be done. All it took was unhooking the RTS controls from the mouse and remapping them to the WASD and arrow keys and spawning enemies in waves. The first prototype had the avatar firing a solid stream of arrows which was essentially a giant laser beam. While we determined it was overpowered for use throughout the game, we’re planning to add it back in as a limited-time powerup. We can’t wait to see the crazy stuff you’ll come up with once the game’s in your hands later this year. In the meantime, you’ll be able to play all three of these games at the next public demo near you! SIGN UP FOR OUR NEWSLETTER FOR THE LATEST UPDATES ON THE ENDLESS MISSION.